Georgia motorists may get their eyes titillated while driving along I-85 this month. Adam & Eve.com, one of the United States' largest adult product providers, is sponsoring four 18-wheelers that will hit the roads promoting toys, adult novelties, DVDs, and lingerie. "We wanted the truck wraps to be eye-catching and provocative," says Chad Davis, Marketing Director for Adam & Eve. "When this marketing opportunity appeared, and our artwork was approved, of course we agreed." A bikini-clad adult film star pictured on the side of a large truck certainly raises eyebrows. The four big rigs (shown right) will feature an award-winning adult entertainment star, Bree Olsen, on its side. Bree Olsen is a multiple Adult Video News (AVN) award winning actress. The AVNs are widely considered to be the Oscars for adult entertainers. 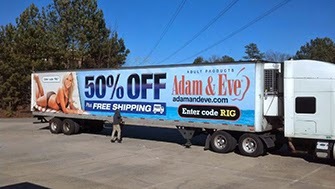 Each big rig points to a "50% off" offer, plus free shipping, when customers use the code "rig" at checkout at Adam & Eve.com. "We are incredibly excited about the opportunity to bring Adam & Eve to the public this way," says Davis. "We are encouraging drivers who run across our trucks along I-85, I-95, I-75 and I-77 to send us pictures via twitter (@adamandeve) and Facebook of the trucks to track their effectiveness and possibly win prizes."